Martin is Managing Director and Founder of Salkantay Partners, a private equity boutique focused on high impact sectors, among them education. He worked at Enfoca Investments, Bain & Co, McKinsey & Co and the Peruvian bank regulator. He serves at three boards, heads the Harvard Business School Chapter in Peru and teaches graduate level courses. He is a Young Global Leader by WEF and a Millennium Leader by the G50 Group. He has published poetry, a few short stories and articles and is passionate about surfing. 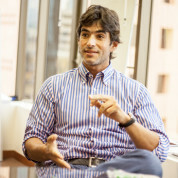 Martín has an MBA from Harvard Business School, and is an Economist from Universidad del Pacifico. "A single motivated and inspiring teacher is the most powerful tool of transformation."